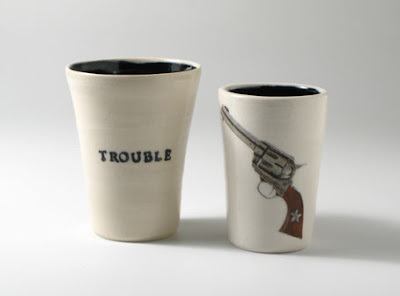 I recieved a very nice present from local ceramicist and girl-about-town Ky Curran over the weekend. I'd been eyeing these little babies off in at Artisan recently (gun love), and now they're mine....aaaallllll mine.....woohoohaaaahaaaa. Thanks Ky!! The real trouble is that I'm starting to run out of shelf space in my house! Running out of room is never a problem. Having too much room is.